Edited by one of the nation’s preeminent labor historians, this book marks an ambitious effort to dissect the full extent of Wal-Mart’s business operations, its social effects, and its role in the U.S. and world economy. Wal-Mart is based on a spring 2004 conference of leading historians, business analysts, sociologists, and labor leaders that immediately attracted the attention of the national media, drawing profiles in the New York Times, Los Angeles Times, and the New York Review of Books. Their contributions are adapted here for a general audience. At the end of the nineteenth century the Pennsylvania Railroad declared itself “the standard of the world.” In more recent years, IBM and then Microsoft seemed the template for a new, global information economy. But at the dawn of the twentyndash;first century, Wal-Mart has overtaken all rivals as the world-transforming economic institution of our time. 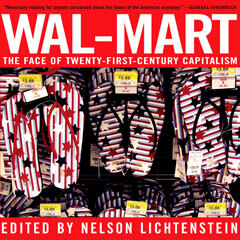 Presented in an accessible format and extensively illustrated with charts and graphs, Wal-Mart examines such topics as the giant retailer’s managerial culture, revolutionary use of technological innovation, and controversial pay and promotional practices to provide the most complete guide yet available to America’s largest company.